STUDENTS of the Akwa Ibom Polytechnic on Monday staged a protest over the alleged increase in school fees by the management of the institution. The Students of Akwa Ibom Polytechnic on Monday protested against the 100 per cent increment of fees by the school’s authority. The Students Union Government’s (SUG), President, Kingsley Eyo, told newsmen at Ikot Osurua in Ikot Ekpene on Monday that the students were not consulted before the increment. He added that the students were not comfortable with the Rector, Dr Israel Afia’s style of administration, demanding his removal by the State Government. Eyo said students wondered why the school’s management would chose to bring new fees regime in this period of economic recession. “The Pre-ND students that were paying N37, 000 are now to pay N69, 200 and ND-1 that were paying 45, 000 are now to pay N76, 200. “ND-2 students are now to pay N65, 500 as against N38, 000; HND-1 will have to pay N85, 700 as against N47, 500. “HND-2 students are now to pay N82, 700 as against N40, 700 that they were paying before”, Eyo said. The students also complained that management had not been publishing their semester results regularly. He alleged that the first semester results of ND had always been delayed to final semester of ND-2. The student union government president also accused the registrar of being insensitive to the students’ plight. Eyo said when the union approached him for dialogue; he retorted that education was not for the poor. 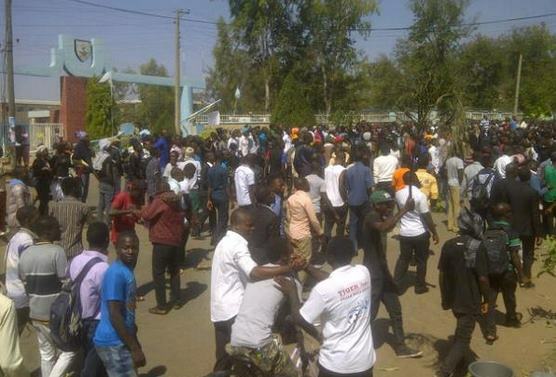 Eyo threatened that the students would go on violent riot if the school authority refused to reduce the school fees. .
Eyo said the management had also hijacked the running of Mami Market from SUG control. “Mami Market used to be controlled by the students, the management hijacked it. The levies from the market were usually paid to the student union government. “We had a meeting with them that since they are collecting the money from the Mami traders, they should give us some percentage. “We needed the money to repair the bus and some other things. “Even the park, there are some buses that are operating within the school campus, they hijacked the running of the park from us”, he said. Rector of the polytechnic, Dr Israel Afia said in a text message that he was in a meeting and would not speak to the press today.